Mopar is one of the most famous trademarks in automotive history. The acronym dates way back to the 1930s, when it was trademarked simply to advertise a line of antifreeze products manufactured by the Chrysler Motor Parts Corporation. But Mopar was soon used interchangeably with the longer Chrysler Motor Parts Corporation name in branding and advertising, and it has become synonymous with durability. Today, Mopar is the organization that handles everything from regular parts and maintenance, to high-end performance gear, and it does so for all Chrysler, Dodge, Jeep, RAM, FIAT vehicles. What Are the Benefits in Using Mopar Accessories and Parts? While there are plenty of mechanics in that’ll fix your Cherokee, they simply can’t compete with genuine Mopar accessories, which will fit your vehicle just right. Now you know the appeal of Mopar accessories, you’ll want to know where to find them. 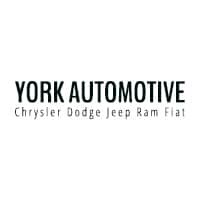 Right here at York Chrysler Dodge Jeep Ram FIAT is where – we offer competitively priced scheduled maintenance and regular specials to help you save on the best parts. Contact us today to find out more. Inspection of these and additional items not listed: tires/tire pressure, windshield wipers, exterior lamps, cooling system mixture/leaks, air filter, fluid levels, belts/hoses (excludes timing belt). Price does not include repairs, which may be required after inspection. See service advisor for complete details.